We have just arrived, jet-lagged, in Cologne, Germany. The Cologne Cathedral is on beautiful display outside our hotel window. It is stunning at sunset. Lovers place these locks on the bridge swearing ever-lasting love and toss the keys into the Rhine. We are traveling and I will be blogging as we go. Please understand that I will not be able to follow and comment on your posts as much as I would like. I will check in though, whenever I can. What an Incredible scene to open your holiday – thank you for sharing! The photo of the bridge is truly stunning. 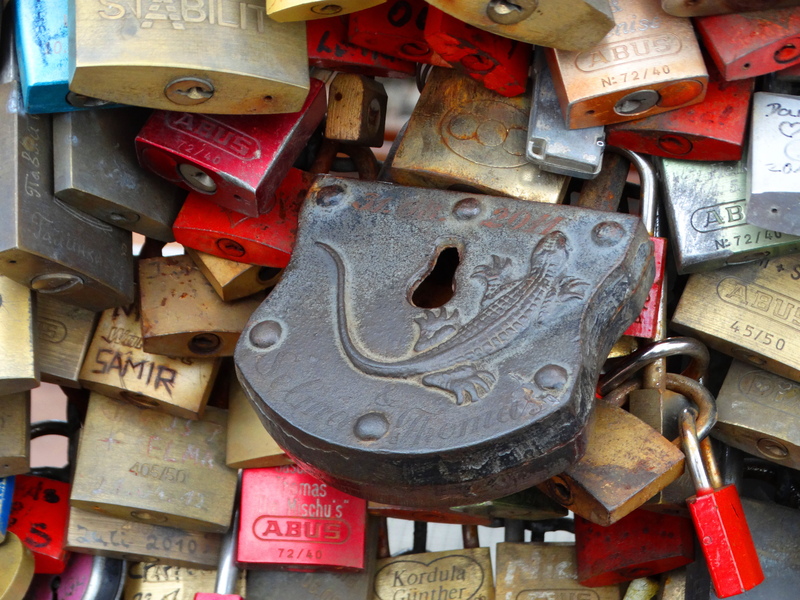 And I love the locks–never knew about that. Happy and safe travels. I just heard a story on this about the love locks and how it is bearing down too much pressure on the bridge. I don’t know if it is true or not, but it is really nice to actually visualize it. Beautiful photos. May your travels be safe, joyful and renewing! 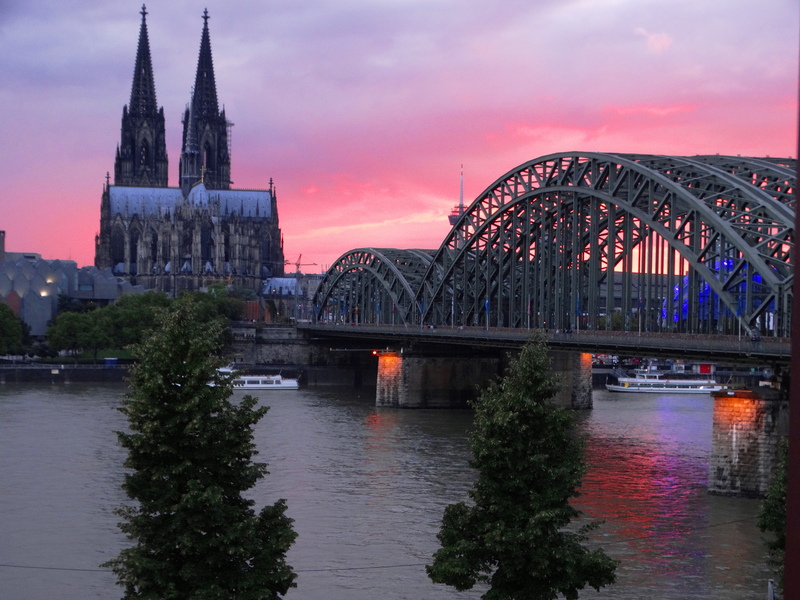 Köln is a gorgeous city and its cathedral one of my favorites. Please enjoy it for me to the fullest! Happy wandering. Beautiful photos! I do miss Germany! Yes, so do I, whenever I am not here. There is something truly remarkable about the place, the food, the friendly people, the charming villages, the constant green, and the Bavarian country life and furniture. I am hooked on Germay! Oh I want to go to Poland so badly! My grandmother was Polish named Piontek! Someday soon…….. Yes, the same here. Last time I saw them was in Prague! Interesting Cindy and I know you will have many more just as interesting scenes to show us. Enjoy your journey. So glad you and Jack are coming along, the church bells are playing Mozart again……. These are great and made me smile. My naughty Reader has been leaving out your Posts. I am all caught up now, I think. And I find I myself unfollowed from posts I have been following for months and months……:( WordPress just likes to keep us on our toes. Yes the same has occurred with me. Impossible to do anything about it whilst traveling which is most annoying!! What a warm tradition… I like this. I wonder is there any room left for another lock? Or do folks just attach locks to lock? There is no more room at The Inn! They attach locks to chains and locks to locks! Gorgeous pictures. Love the locks! Kholn…I simply loved it when I visited it some years ago, during Christmas holidays…so beautiful! Cindy, that view is stunning indeed! I love the idea of ‘love locks’. How romantic! Awesome photos, as usual. Have a fabulous time! Thanks so much and Germany is quite a romantic country. Cheers to you Rebeca! Those locks are amazing. I saw that on another blog–but not as thick as here. I love different cultures. Awesome Cindy. I wish you happy travels!!! Fabulous, Cindy! Did you attach a love lock? I would if I were there! I didn’t think of it and couldn’t find any room!!!! “lol”!!!! It does look intensely crammed! Such a wonderful way to demonstrate the diverse and beauty in ‘locks’ Cindy! I loved the gorgeous sky in the first picture! 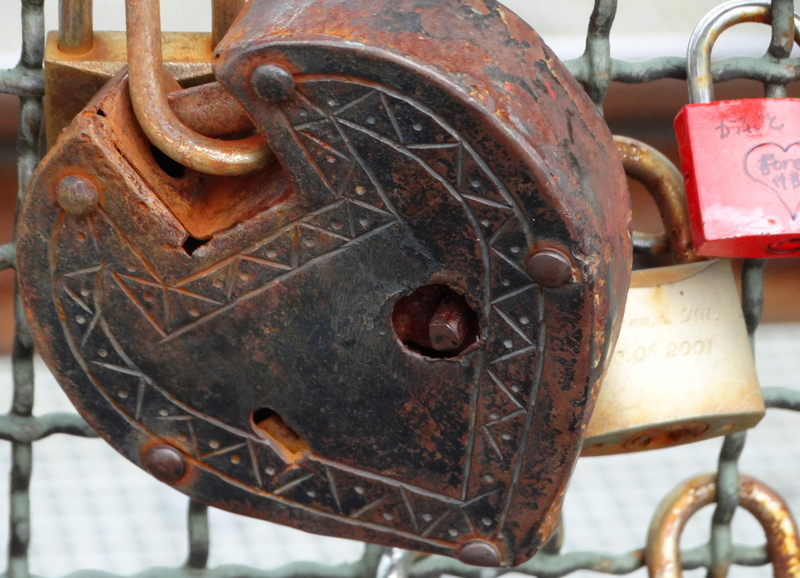 I am enthralled with the ‘love locks’ on the bridge of the Rhine. this reminds me of “Letters to Juliet” and the way they are given such prominence in France. The one with the crocodile or alligator is so cool, along with the photo of all of them combined. Thanks for the views, Cindy! Thank you for your observant and detailed eye my friend and for your always thoughtful comments! One of the loveliest trips in the world, passing through some of the most idyllic villages, and of course the incredible German food. You will have the most delightful time! Who gets to dredge up all those keys? Enjoy your travels. Laughing, never thought of that!!!! Imagine a metal detector!!!! I thought I recognized that cathedral 🙂 My paternal grandmother was born in Cologne. So glad you enjoyed and cheers! I am jealous to see your photography…………. 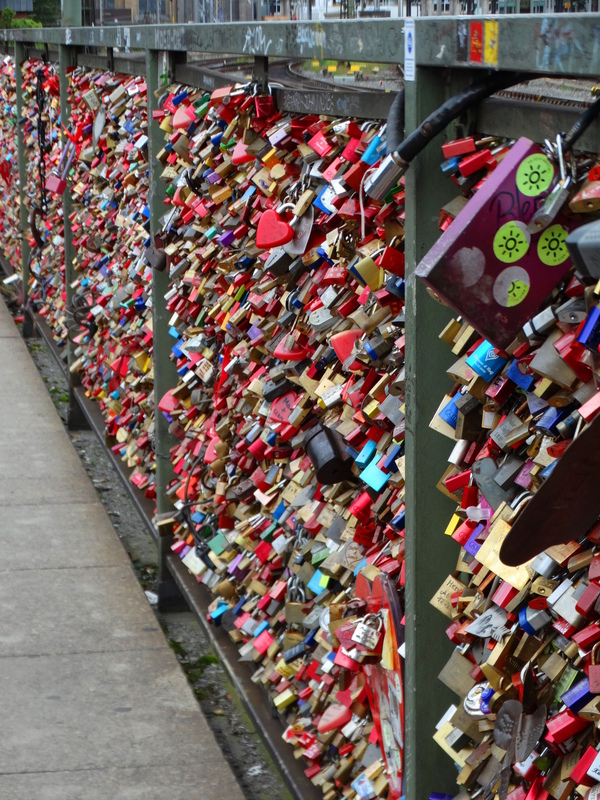 I would like to use the picture from your site (https://cindyknoke.com/2014/08/19/love-locks-of-the-rhine) in a academical presentation. Would it be possible to use providing i state where picture comes from? Yes of course thank you for asking. I would be honored and you don’t need to ask in the future.